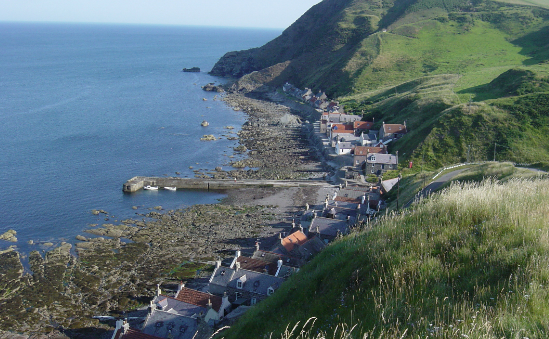 Crovie is a unique village on the Aberdeenshire Coast in the North East of Scotland. It has been described as " the jewel in the crown " and the best preserved 19th. Century fishing village on the Moray Coast. It is made up of a single row of houses built on a narrow ledge above the sea shore. Crovie was built long before cars and is only accessible on foot - barrows are used to transport everything from one end of the village to the other. 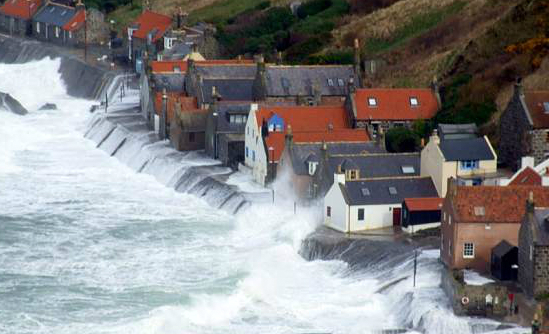 After a major storm in 1953 during which the village was very badly damaged, the local council wanted to abandon it but to prevent this happening the Crovie Preservation Society was formed and this led to a campaign to restore the village. Today the village comprises around 60 houses. While only 2 houses are used as permanent residences, it is thriving again as a popular location for second homes and holiday rentals.